The Silvanberry is a hybrid developed in Silvan Victoria. With large glossy fruits Silvanberries produce from early summer and are easy to pick. They also last well on the bush in warm weather. 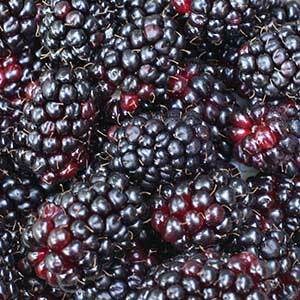 These are a complex hybrid between Marion berries and Boysenberries and produced elongated deep red to purple fruits, juicy and high in vitamin C.
The fruit is excellent for eating fresh, making jams and preserves as well as for using in pies, on cakes and blended drinks. The plants themselves are easy to grow, vigorous and Silvanberries will spread naturally by underground runners. Heavy cropping, a few plant will produce ample fruit for the home gardener, and as they spread you will soon have an excess. These are a berry that freezes well, so surplus fruit can be used over the winter months as required. In the home garden, if you like to keep thing under control we suggest planting Silvanberries in an area with a root barrier. Most growers simply pull out the unwanted runners as they appear. Growing best in an area where winters are cool and summers warm, choose an open sunny position. A trellis or some other means of support is suggested for easy of picking. This also make netting easier if birds are problem. Soil should be well drained with plenty of well rotted compost dug in well before planting. Canes are available for sale in winter, and should be planted early spring at the latest for best results. New plants should be watered in with a liquid seaweed fertiliser. In good soil Silvanberry plants will require little extra fertiliser during the season. In poorer soils,applications of a liquid seaweed fertiliser every 2 weeks is recommended. Keep the area around the base of the plants free from weeds and well mulched to help retain moisture. Each winter remove the oldest canes by pruning back to the ground. Unwanted runners can also be removed. This is a good time to tie canes to the trellis ready for the spring. Use Bird Netting to maximise the crop. Provide good air circulation to help prevent fungal disease. Try silvan berries from the U Pick farms in the Dandenong Ranges Melbourne. Silvanberry plants are available fro sale from the following suppliers.